Do you have a dog with holiday stress? Every year, Haley watches as I begin to drag out all of our Christmas decorations. Some are in the garage, some in the basement and others in closets. She’s a velcro dog, so she follows me on my many trips back and forth and all around the house while I gather the objects of festive cheer and distribute them elsewhere around the house. But that’s just the beginning of all the busyness that takes place this time of year. She tags along while we select and cut down our Christmas tree, she’s on floor duty in the kitchen to supervise all the cooking and baking and she makes sure I don’t miss any of her stray clumps of fur when I’m cleaning the house before the kids come home. When I move, she moves. And as December 25th gets closer, I’m even more rushed and pressured to get things done. As busy as I am around the holidays, Haley stays just as busy. Plus, she needs more sleep than us humans. She loves it when the kids are home for the holidays but between all the playtime, walks, parties, early mornings, late evenings and all the other happenings, she definitely misses out on some of her zzz’s. Haley handles the stress, lack of sleep and change of routine pretty well, but some dogs tend to get a bit grumpy around the holidays. Our poor pups may be tired, overloaded and even downright cranky at times. This is especially true for reactive and senior dogs. It’s understandable why some dog bites occur at the end of a long evening of partying with guests. But there’s no reason for our pooches to be all “Bah Humbug” about the holidays because I’ve got some tips to keep your pup relaxed, rested and cheerful all season. 1. Stick to your routine. Try to stay with your normal routine as much as possible. With all the activity going on, it’s easy to skip a walk, be late with feeding a meal or forget about a potty break, but our dogs love their routines and some get stressed when too many things are out of sync with their normal schedule. Also, be sure not to confuse your dog by relaxing the canine house rules. 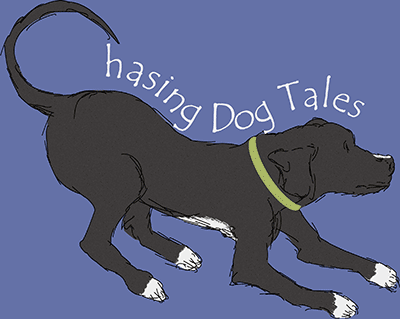 Dogs need both exercise and mental stimulation as well as downtime and rest. Make sure they get a balanced ratio of both even if you have a houseful of guests and a busy schedule. When things get chaotic for you or your dog, find a quiet place to relax and take a break together. Our dogs pick up on our anxiety, so if you’re frazzled, chances are your dog will also be affected by your state of mind. As a velcro dog, Haley gets quite a bit of exercise just following me around the house when I’m busy, but some dogs need their daily walks or high-energy playtime so they don’t become frustrated or destructive. A daily walk goes a long way to reduce stress levels and overexcitement in dogs. If you’re too busy, enlist the help of a friend or relative to walk your pup. 5. Spend quality time with your dog. Whether it’s going for a walk, playing together or settling down to give your pup a belly rub, spend a little quality time each day with your dog to give them a sense of their normal routine. 6. Skip the festive dog attire. If your dog’s not a big fan of wearing holiday clothing or accessories, give them a break this year and allow them to enjoy being au naturel. Some dogs don’t mind getting dressed up, but most prefer the freedom of just sporting their natural fur coats. 7. Provide a safe place. Make sure your dog has an area of the house to retreat to if they get overwhelmed, especially during parties. If your dog becomes stressed, a crate or quiet room is the perfect place for them to feel safe and unwind. Giving your dog a timeout can help relieve stress, but if your pup doesn’t like being alone, toss in a frozen, peanut butter Kong or bone to keep them occupied for a while. 8. Watch the little ones. Yes, the kids! Grabby or rambunctious children and tired dogs are not a good combination. Parents should keep a close eye on their kids, but ultimately it’s your responsibility to prevent a dog bite. Young kids and dogs shouldn’t be alone together during a party or gathering. You can always keep your dog on a leash to make it easier to supervise them around kids. 9. Monitor your dog’s diet. We’re not the only ones that gain weight during the holidays. Our dogs can put on a few extra pounds too. Those little beggars are getting handouts left and right and some people might not realize which foods are dangerous for dogs. Avoid the additional stress of your dog getting an upset stomach by keeping a close eye on what they eat. Also, be sure to keep their water bowl filled and prevent your dog from getting into the trash. If you have a dog that finds trouble or likes to eat all sorts of items, avoid poisonous holiday plants, lighted candles and small or strings-type decorations that could be ingested. Also, live Christmas trees can pose a hazard for some dogs. Between package deliveries and guests coming and going, there will be plenty of opportunities for a curious pup to slip outside. Although it’s usually a guest that lets the dog outside, consider using a leash on your dog if you’re worried they might slip out and potentially get lost. 12. Don’t force your dog to participate. If your dog’s uncomfortable in a particular situation or when meeting people, don’t force them to interact. Allow them to approach if and when they’re ready. If a guest shows up with their dog, don’t force your dog to greet or play with the other dog if they’re resistant. Dogs, just like people, handle stress in different ways. Some dogs withdraw, some becoming clingy, some may show signs of anxiety, and others might display destructive behavior. As you keep a close eye on your pup during the holidays, watch for these common signals that your dog might be stressed or overloaded. 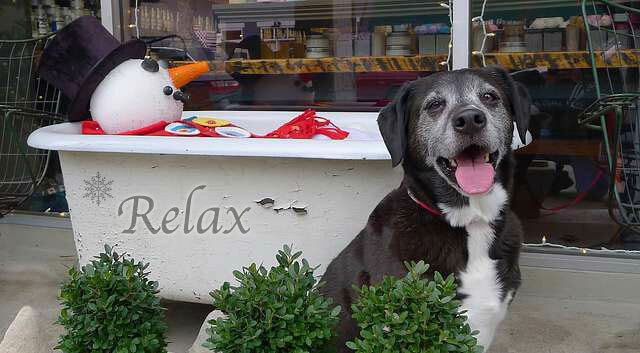 The holidays are as crazy as they are wonderful so having a strategy to deal with stress will help both you and your dog. When things get especially hectic, my favorite way to unwind is to take a timeout with Haley and give her a nice belly rub. It quickly helps to de-stress both of us and it works wonders for renewing our energy and spirits. I think Haley’s favorite way to relieve stress though is to tear up every single cardboard box on Christmas morning, haha! So, during this holiday season when our dogs tend to get less attention and exercise, give your dog the gift of some TLC along with those bones, treats and toys. It just might be their favorite gift this year! 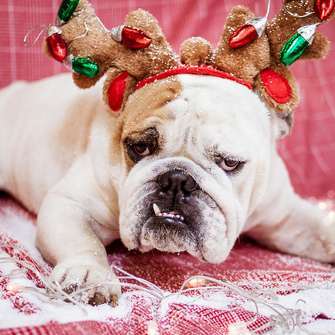 How do you help your dog with holiday stress? Share your tips in the comment section below! Do Dogs Need Sweaters in the Winter? Great tips, have a great holiday season. Thank you, JoAnn! I hope you all have a wonderful holiday too and here’s to a fantastic 2017! Thanks for all the tips. Chops has sailed through the first Christmas party with flying colors. The guests were all grown ups which helped. Needless to say there wasn’t anything to vacuum afterward. She loves it when the little kids arrive. Have a wonderful time with your kids and I will send some hugs home with a couple of them. MERRY CHRISTMAS HALEY! Chops is such a little sweetie.? I’m so glad you two found each other. Me and Haley wish you and Chops (and the whole family) a beautiful Christmas this year. I’ll look forward to those hugs! We are lucky we get around a lot, so things like the holidays are just another adventure for us. With the puppy we have to be more careful she doesn’t get into stuff, but otherwise, we deal with most things just fine. We feel bad for dogs who are used to a rut and are afraid of changes. You’re going to have a wonderful Christmas this year with the new puppy. They always bring a lot of laughter with all their antics, haha! Great tips. 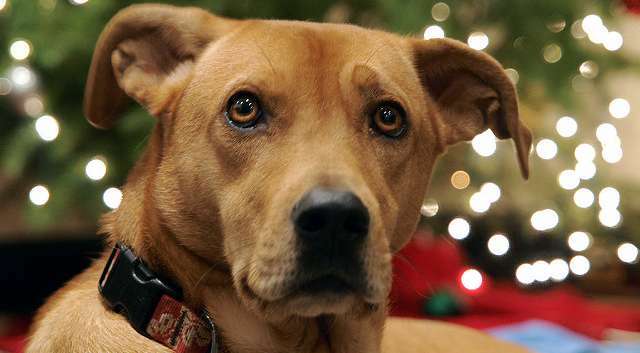 The holidays can be stressful for both ourselves and our pets. It can get pretty crazy sometimes. Hopefully being a little ahead of schedule this year will make a difference. I hope you and yours have a wonderful holiday this year, Tonya!? Great tips! We hope you have a stress free holiday season! That’s the goal, haha! I hope your holiday season is sprinkled with golden magic! My dogs are the best part of the holiday season. I had such a stressful day Friday, driving 100 miles to an office Christmas party. The best part of the day was playing with my dogs in the snow before I left. I feel the same way, Kari! Sometimes the ordinary moments during this time of year are when I feel the most holiday joy. Dogs are great for keeping us grounded and remembering what’s really important.? What a great post. It’s so important to reduce the stress the holidays can bring not only to us humans, but also to our babes. Thanks so much, Shanna! I hope you have many wonderful moments and memories this year! Great information. I think many times people get so caught up in the holidays they forget about the stress on their pets. We don’t usually have much traffic through our house on the holidays, but I think Ruby still senses something is going on. That’s so true. There’s so much to do and sometimes we have unrealistic expectations for everything to be just perfect. I’m learning to get over that, lol! I hope you and Ruby have an amazing holiday season this year! Merry Christmas to you & Haley 🙂 Providing a calm space where a dog can get away from a busy house full of people is a really good idea, maybe combined with a tasty, long lasting chew. And I certainly second the child/dog supervision. Aw, thanks Barbara! I hope you guys have the most joyful Christmas ever and Buzz and Missy have some wonderful surprises in their stockings this year. Merry Christmas!? Such good tips. I’m thankful that my crew seems pretty darn relaxed about the entire holiday season, but I know it can be really stressful to live with high-stress little ones who worry. Your tips should certainly help. So glad to hear all is calm and bright at your house this season. I bet Santa will be very good to Liam and Sinead on Christmas morning.? The holidays are the worst and our weather is making everything difficult – I like the tip about finding a safe place for your dog. When we have guests over it’s sometimes easiest to put the dogs upstairs at first until people are in the house and the dogs can safely roam. Great tips – this time of the year is STRESSFUL. I hope the tips are helpful, Christine. The weather this weekend is pretty crazy too. I’m already looking forward to summer, haha! These are such great tips! It’s easy to forget that our pets feel the holiday stress too. I love that bathtub photo, BOL!!! Sharing. Thanks so much for sharing the post, Cathy. We all should make time for a relaxing bath this holiday season, right? 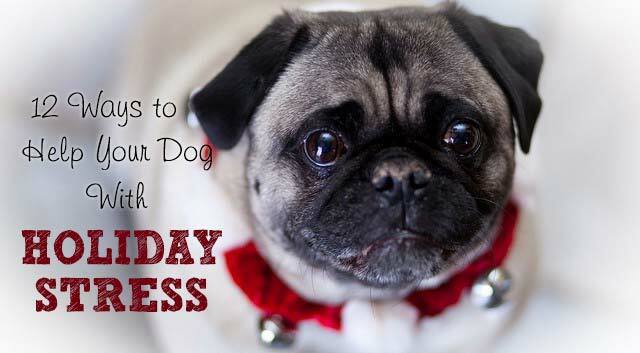 We are lucky that our dogs don’t get stressed during the holidays, but these are great tips! Thanks! I’m glad your pack is kicking back and enjoying all the wonders of the season. Enjoy! ? We do the same thing, Jackie. Last year was our turn to host the party, so I’m enjoying the next fews years off, haha! Merry Christmas to you and Rita! Great tips! We try to keep the dogs out of the way when people are arriving so we don’t have to worry about any escapes. Then once everyone gets settled the girls can come and socialize. Luke, unfortunately, still has to be kept away from company. But he’ll get a nice kong and just be separated by a gate so he doesn’t feel so isolated. I hope one day he’ll be able to just be in the crate but we’re not quite ready for that for this year’s holidays. We need to try with less people first and work up to that. He’ll still get his potty breaks and time to play outside. We always make sure they all get their play time before company comes over so they’re more apt to want to relax later. That’s a great tip, Jan. Sometimes I’m so busy, it’s hard to find the time to exercise and play with Haley before everyone arrives, but that would really help with her excitement level. I also like your (and Christine’s) tip about keeping the dogs separated until everyone has arrived and are settled in. You’re so good with Luke and he’s so smart, I’m sure you’ll have him hanging out with your guests one day soon.? Those are excellent tips. Other than a little decorating we keep things pretty routine around here. That sounds perfect for the pups. I hope you all have a fantastic holiday and wonderful 2017! Along with your tip about not forcing the dog to wear holiday attire, I would also say not to force them to pose for photos if it makes them uncomfortable, especially forcing them to pose with other pets. This really stresses my dog Ace out when he has to sit close to our other dog. On the other hand, some pets don’t mind putting up with photos! Great post, I shared it in That Mutt’s newsletter today. Thanks for sharing the post, Lindsay! You make a great point about dogs and pictures, especially groups pictures with other dogs. It reminds me of a group shot with our family’s dogs that didn’t go so well, lol! Awesome tips! Thanks for sharing! Happy holidays not only to us but to our pets as well! Thanks Chris! Wishing you and yours a fantastic 2017! ?